Alcaucin Malaga - Getting from Malaga airport to Alcaucin. Alcaucin is a municipality in the province of Malaga, situated in the Axarquia region, between the Tejeda mountain range and the Axarquia Mountains and borders with the province of Granada to the East. 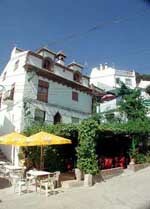 This village has the typical qualities of the white villages of the Axarquia with its narrow streets and whitewashed houses situated without a specific order, typical of the Moorish urban organisation. In Alcaucin, not only will we be able to enjoy its fantastic gastronomy, but also its beautiful views over the whole Costa del Sol due to the height of its location. The name comes from Arabic origins (al-qawsayn) which means 'The Arches', probably due to the existence of a roman aqueduct or to the abundance of Yew trees, from where they got the wood to build the arches for battle as well as for hunting. According to several archaeological findings, Alcaucin was inhabited since prehistoric times as they found remains of Neanderthals in the well-known “Boquete de Zafarraya” (Zafarraya hole). Later on, it’s known as a fact that the Phoenicians established the foundations of the Zalia fortress, but it was the Arabs who finished building the castle that the Catholic Kings conquered in 1485. Later on, around the year 1569, the revolts and uprisings set off when they attempted to force the Moors to become Christians. Alcaucin was probably originally a small rural village, protected by the presence of the Zalia castle to the southwest and the Alcazar castle at about 5 Km. to the northwest. At about 5 km away from the town we’ll find these sulphur baths that were used by the Arabs in ancient times, and were known as 'Las Majadas', recommended baths to cure skin rashes. There are several religious buildings constructed during the reign of the Catholic Kings according to their beliefs, like the Rosario parish church and the cemetery’s chapel founded in the 18th century. The best route to get to Alcaucin from Malaga airport is on the motorway towards Velez-Malaga, once we get there we turn off and follow 'La Viñuela' road up to the Don Manuel bridge, from where we’ll take the signposted road that will take us directly to Alcaucin. 68.5 km journey by car (the road is good so you will reach Alcaucin in barely 1 hour). Find the cheapest car hire Malaga airport deals and see how to get from Malaga airport to Alcaucin. Official website: Ayuntamiento de Alcaucin.